This was another Ebay purchase from the US, so with shipping it worked out to be moderately priced. The ink came in the generously filled 3oz bottle, inside the usual white box with black line art. 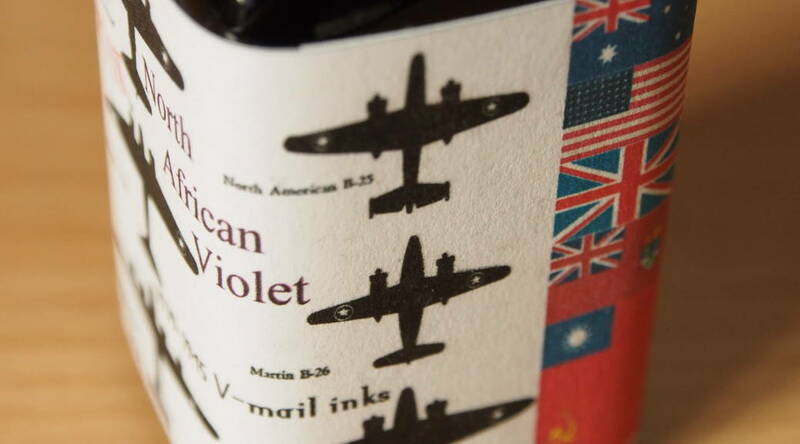 The label has the silhouette images of WWII planes along with what I take to be flags of the Allied forces – although to my shame I don’t recognise a couple of them. 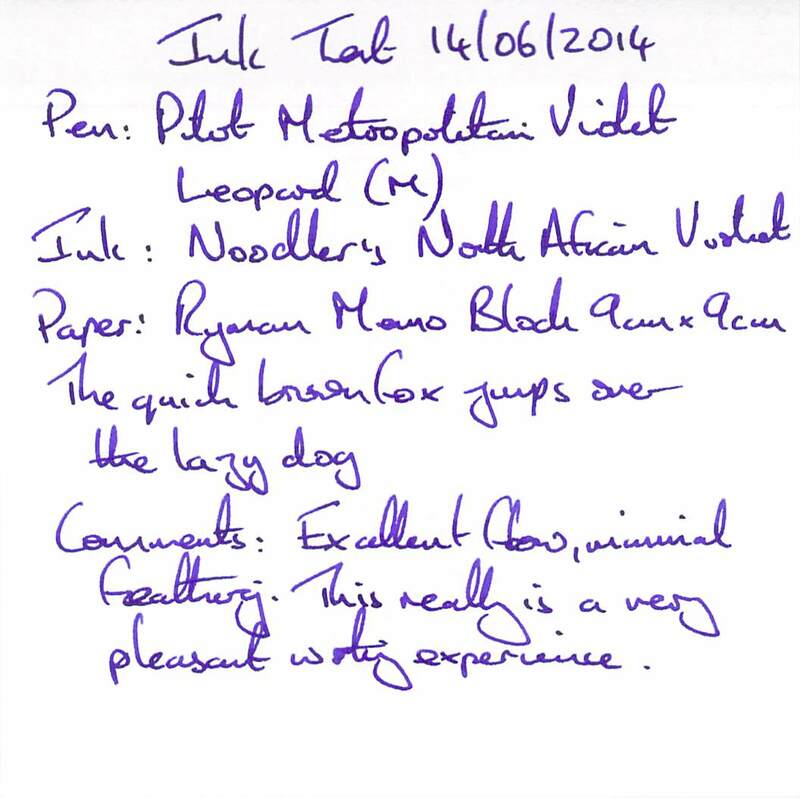 The pen used for this review was a Pilot Metropolitan Violet Leopard with a medium nib, and the colour matches the ink perfectly. This is currently the only true Metropolitan that I own. It had two drawbacks for the purposes of this review. Firstly it was fitted with a CON 20 converter, which made it hard to check for staining – I will use a CON 50 for future tests. Secondly try as I might I could not remove the nib and feed for cleaning. 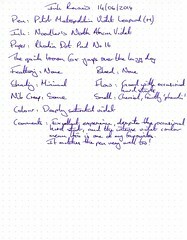 All my Pilot MRs come apart easily and I can’t find any reference to the nib unit being sealed on any other Pilot Metropolitans, so either this is a faulty pen, one of a limited number with sealed nib units, or I’m just not using enough force – but I didn’t feel safe using any more. This is not enough to put me off using it for ink reviews in the future, but I need to take this into account when considering ease of cleaning with inks. In fact I didn’t experience any problems cleaning out this ink. Dry time time was around 30 seconds which is on the longer side. 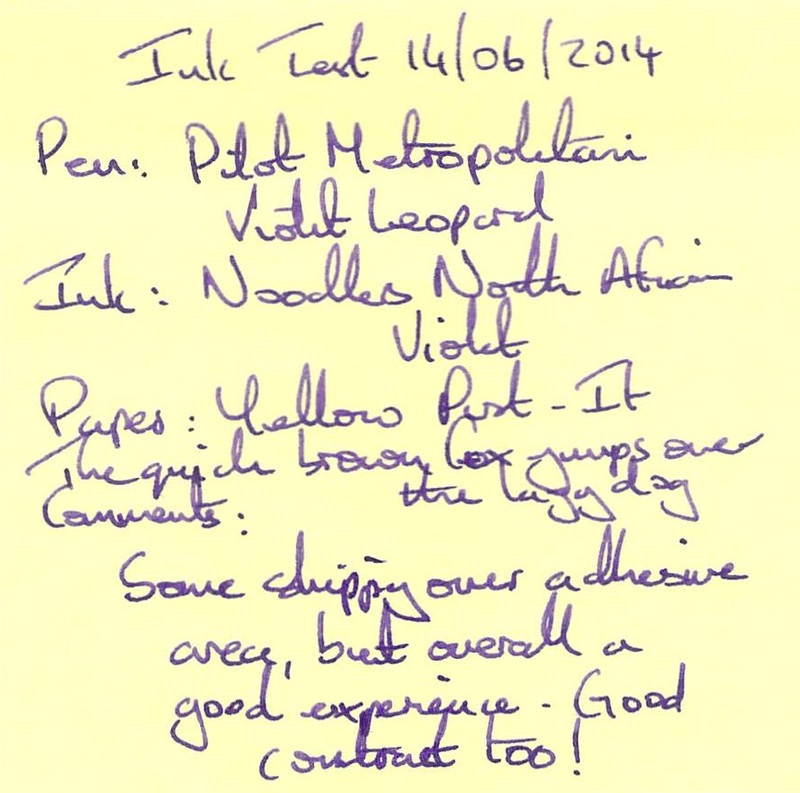 Water resistance was good, although not 100% – some of the ink did wash away or cause smudging with water drops. 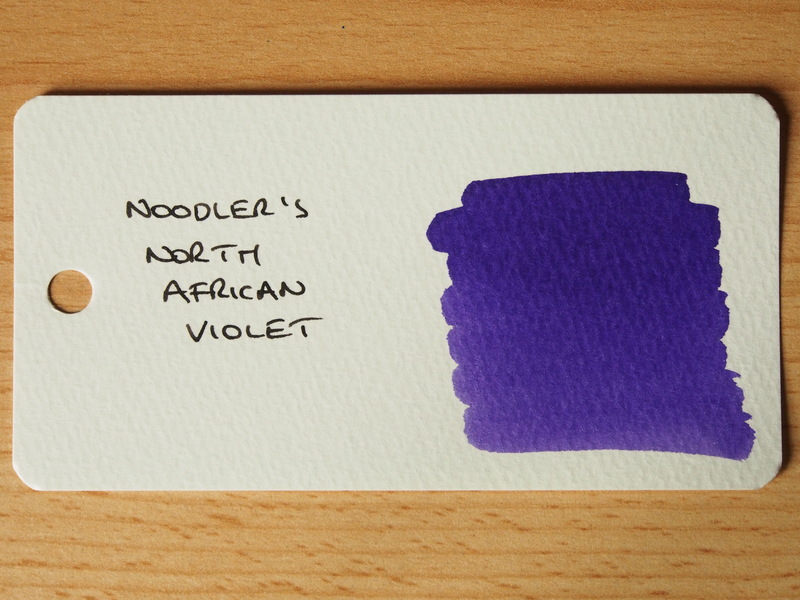 The colour on this paper was a very attractive, deep saturated violet – an instant favourite. Flow was slightly restricted, and there were a few hard starts, but nothing remotely unsatisfactory. The smell might bother others, but not me. Another pleasant experience. I can’t think of anything negative. Minor skipping over the adhesive areas, but not enough to put me off. The contrast with the paper colour is strikingly attractive to me. The feathering and bleeding weren’t good. While I’ve seen worse I can’t claim it’s satisfactory. 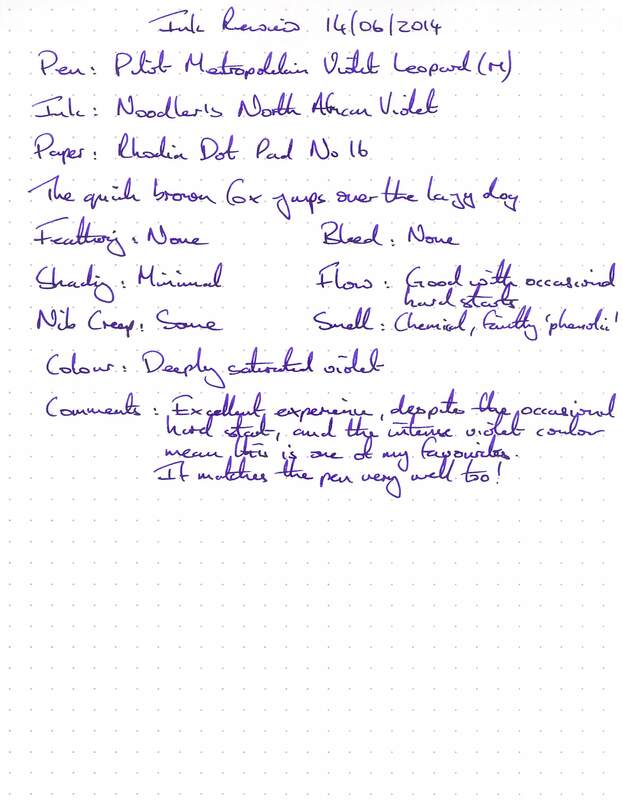 If anything the Word Card appears slightly lighter than the handwriting tests – the darker parts of the swab are closer to the deeply saturated violet that I really like. 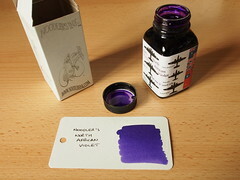 I really like this ink, and I can see it forming a regular part of my rotation. Definitely one to restock when the time comes.